Totem is the primary media player in GNOME. Using a few plugins, it can be used as a UPnP/DLNA client to browse and play content that is shared by a DLNA media server like ReadyMedia. Open Totem and click the Channels tab. Among other channels, you should be able to see your DLNA server. You can browse its contents and play them back using Totem. DJMount is a program that can be used to mount the content of a UPnP/DLNA media server on your network to your filesystem. Once it is mounted, you can navigate the server’s content folders using any file explorer and play the files using any media player. You can now view all the media servers available in your network and their contents using any file explorer at the above mounted directory. eezUPnP is a UPnP/DLNA client or player to play audio content from a UPnP/DLNA server on the network. It is written in Java and the binaries for it can be downloaded from here. After unzipping the downloaded file, run the CP binary to open eezUPnP. 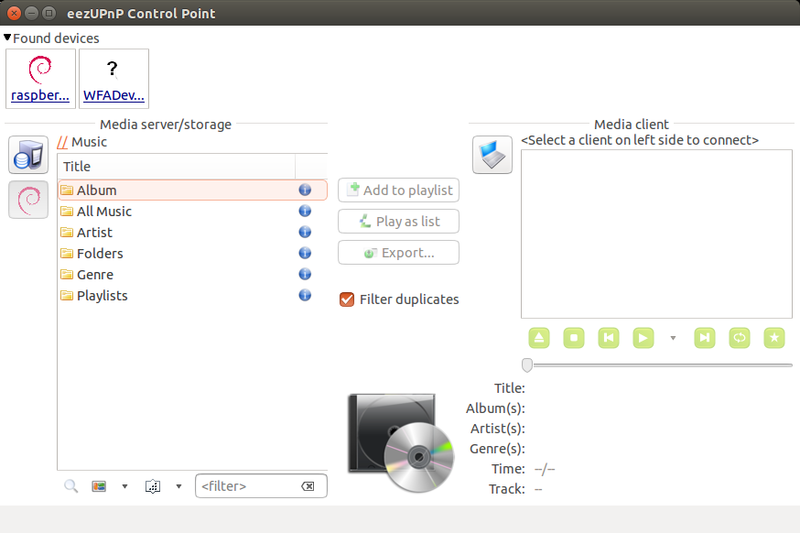 UPnP/DLNA media servers detected on your network are displayed on the right side. Click on one of it and you can navigate the content it offers. Click the eezUPnP integrater player icon on the right to choose it as the player (there is nothing else on offer). eezUPnP focuses on only playing the audio files of the media server. Choose the audio files you want to play in the left column and click the Add to playlist button. These files appear in the right side and can be played using the integrated player. A UPnP/DLNA media server, like for example ReadyMedia, can be used to stream video and audio files to any UPnP/DLNA player or client on the home network. VLC can be used as a UPnP/DLNA client or player to play the video or audio content of any UPnP/DLNA server on the network. 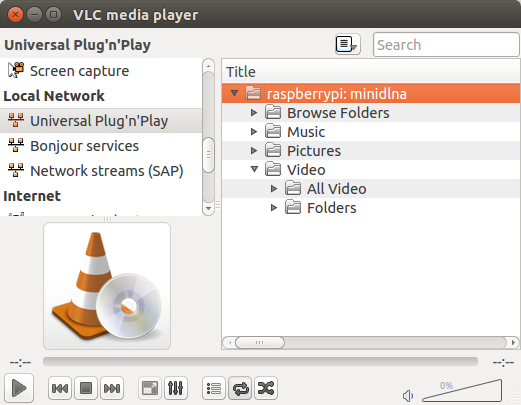 In VLC, go to View -> Playlist. Click the Universal Plug n Play option in the left column. VLC tries to locate all the UPnP/DLNA servers on your network and your UPnP/DLNA server should be displayed. Click on it. A dropdown arrow should appear to the left of the server (this can take a while, see note below). You can explore the hierarchy of content folders of the server from here on. Whatever files you wish to play in VLC, right-click on them and choose Add to playlist. This is good for audio files. For video files, you might prefer to right-click and choose Play to view it immediately. Note: VLC can take a lot of time (say 5-10 minutes) to display that dropdown arrow beside the server name. This is because it tries to pull the entire folder hierarchy of the server. This problem has been documented by the VLC developers, but will not be fixed anytime soon due to resource shortage. MediaHouse UPnP/DLNA Browser is a UPnP/DLNA server and client for Android. It can both serve the content on your Android device to your home network or receive media streams from a UPnP/DLNA server on your home network. I found the UI to be straightforward and convenient compared to the complicated UI of other such apps. Videos can be played through an external player. Thankfully, music files in a folder can be queued up to play in ordered or shuffled mode. Just long-press the folder to get the menu where you can do this. The free version has a small restriction though: the number of music files that can be added to playlist is limited. BubbleUPnP UPnP/DLNA seems to be most popular UPnP/DLNA server and client for Android. It can both serve the content on your Android device to your home network or receive media streams from a UPnP/DLNA server on your home network. I used it as a UPnP/DLNA client to receive music and videos from a MiniDLNA server on the home network. The videos play fine through an external player. Music files in a folder can be added to a playlist for ordered or shuffled play. However, in the free version only 16 music files can be played back in this way. That is a big disadvantage if you are not willing to pay for this app. UPnPlay is an UPnP/DLNA client that can be installed on Android devices from here. This app is primarily designed to play the music from your UPnP/DLNA media server. It has a simple music player UI with album art, playlist and the common operations (next track, shuffle and repeat). It can also be used to play video files, by using an external renderer. The main advantage of UPnPlay is that it is free, has no ads and no restrictions. There are other free media clients that have far better UI and features, but they all come restricted (like playlist size or the number of items that can be played) until a Pro or paid version is used. I primarily use UPnPlay to play music. The UI is rudimentary and clunky. But, do spend a few minutes pushing the buttons and you will fully understand the interface. It is actually quite intuitive once you learn it. The only missing feature was that I cannot add all the files recursively under a root folder to the playlist. I created a workaround for this by creating M3U playlists for those directories and placed them in my root music directory. UPnP/DLNA supports such playlists and the files in it can be added in UPnPlay to its playlist in one touch.